This recipe come from Joan’s on Third, a specialty food store and restaurant located in West Hollywood, Los Angeles. A great little place with a refreshing yet comfortable atmosphere and a great menu selection. Luckily for me, I found the recipe on the LATimes and I was able to recreate it home — meaning that I don’t have to fly to LA if I get a curried chickpeas craving. 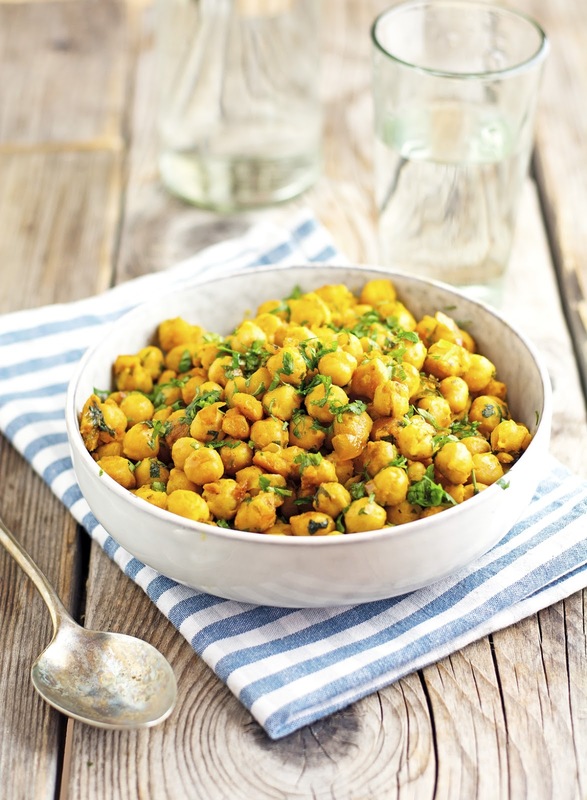 These Curried Chickpeas are a protein and flavored packed salad that comes together in 20 minutes flat. It’s a great little recipe to have on hand at all times. Caramelized onions, spices, lemon juice, and cilantro are mixed with chickpeas to create something unique and delicious. The curry blend in this recipe gives an otherwise simple salad wonderful depth and hearty flavor. Coriander and cumin lend fragrant earthiness, with a little cayenne pepper added for just a bit of heat. The caramelized onions add richness, and the cilantro and lemon juice brighten the salad nicely, distinguishing the flavors. What I love about this recipe is that you can whip it up in a heartbeat. That is, if you use canned chickpeas as suggested. If instead you wanna start from scratch using dried chickpeas, then it’s a different story. In principle, I tend to recommend to cook from scratch but this time around you should take advantage of canned chickpeas. Last but not least, you can make it in advance — this is one salad that improves as it chills. Make a double batch and eat it for the rest of the week. Score! 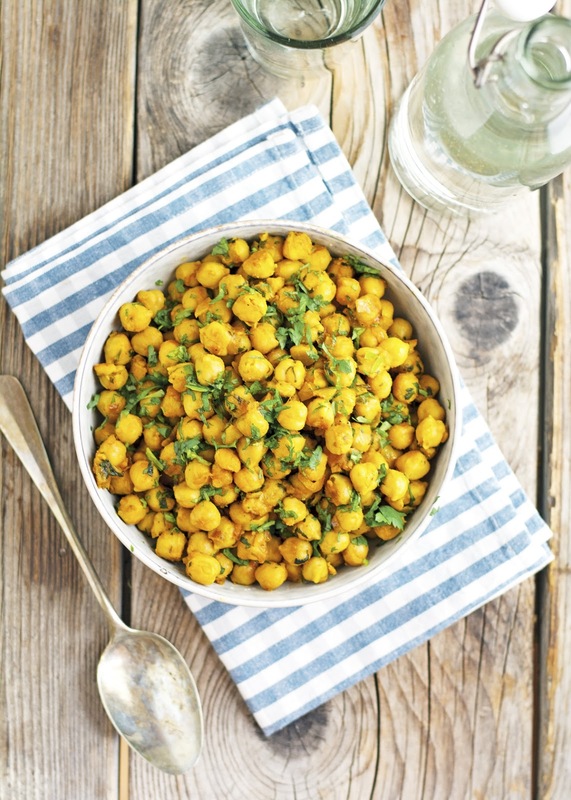 Curried Chickpeas Print this recipe! Heat oil in a large pan (or skillet) over low heat. Add onion and salt and sauté for about 10 minutes, until it becomes translucent. The onion should start sweating and yield, but not brown, so keep an eye on the pan the whole time and stir every so often. When the onion is soft and translucent turn the heat to medium and add turmeric, cumin, coriander, and cayenne pepper. Sauté for 60 seconds, until the spices are toasted. Add chickpeas, lemon juice, 1 tablespoon of chopped cilantro (or parsley), and ground black pepper. Cook, stirring constantly for further 5 minutes to let the flavors blend. Remove from the heat and let cool completely. 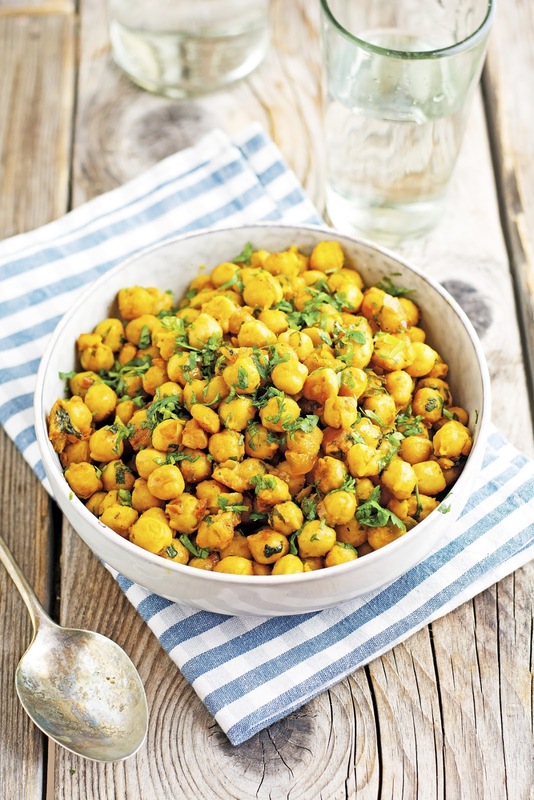 If the chickpeas look a bit dry, sprinkle with some oil and a few drops of lemon juice. Before serving, sprinkle with chopped cilantro (or parsley) and a bit of oil if needed. One serving yields 230 calories, 12 grams of fat, 19 grams of carbs, and 9 grams of protein. 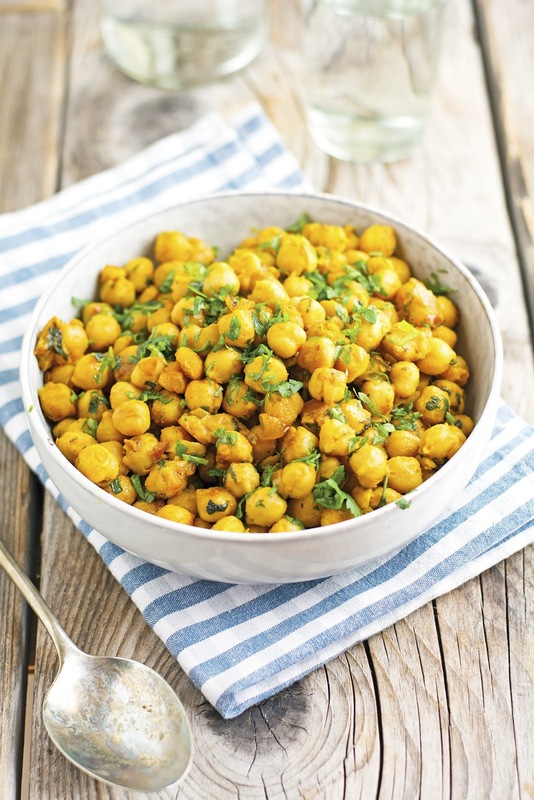 It's one of my fave recipes with chickpeas!